July 6, 2012. (Grenada, W.I.)? Heat things up this summer with a trip to Grenada, ‘The Spice of the Caribbean.’ Take advantage of Grenada’s summer specials and enjoy the countless luxuries and activities, from scuba diving to sightseeing, which the island has to offer. Blue Horizons Garden Resort ? Visit Blue Horizons Garden Resort this summer and enjoy a self-catering suite with resort amenities. This special includes seven nights, daily continental breakfast, welcome drinks, round-trip transportation to the airport, scuba diving lessons, a three-hour sightseeing tour and yoga for beginners. The Flamboyant Hotel & Villas ? Specials are available throughout the summer at The Flamboyant. Book room only for US$ 50, room and full breakfast for US$ 72 or US$ 110, or all-inclusive for US$ 145. Prices are daily per person, based on double occupancy. Rates include all taxes and service charge. Use booking code SUMMER12. For travel until July 31, and August 16 through November 30. Laluna ? Stay for seven nights and pay for six at this chic property. Upon booking at least seven nights in a Cottage Suite including breakfast and dinner (excluding drinks), enjoy a free night at Laluna! LaSource ? From August 5 ? 18, this all-inclusive resort will feature Trevor Laurency, a fully qualified fitness and holistic instructor, who will be teaching a wide range of physical fitness and well-being classes. Spice Island Beach Resort ? 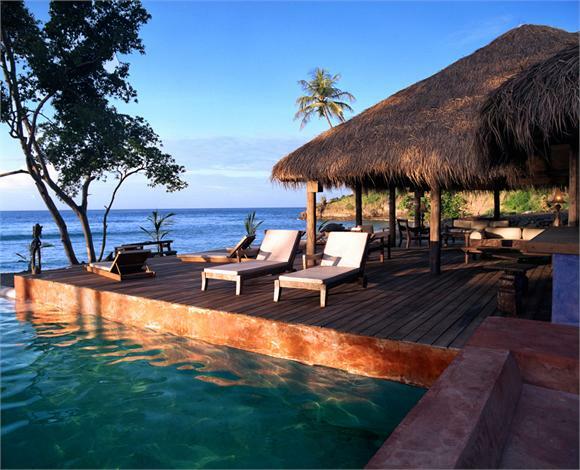 Book your stay at the luxurious Spice Island Beach Resort and receive complimentary nights. Book seven nights and pay for six; book 14 nights and pay for 12; or book 21 nights and pay for 18 though October 31, 2012. True Blue Bay Resort & Villas ? Book early and take advantage of True Blue Bay’s summer specials. When you book at least three nights in July, September or October you will receive 30% off. These specials are offered at the perfect time to thoroughly enjoy Grenada, as the season is filled with special events including the Rainbow City Festival, Carriacou Regatta and Carnival. About Grenada Board of Tourism? The Grenada Board of Tourism’s objective is to market and promote Grenada as a preferred year round Caribbean tourist destination, while providing technical and managerial support to the travel trade, industry partners and airlines. For more information on Grenada, contact the Grenada Board of Tourism at 416-595-1339, email at tourism@grenadaconsulate.com or visit www.grenadagrenadines.com. To receive the Grenada Board of Tourism’s regular newsletter please visit the website. Grenada can be reached via Caribbean Airlines with their year-round twice-weekly (Thursdays and Sundays) direct flight from Toronto to Grenada. Air Canada Vacations operates a seasonal non-stop flight from Toronto to Grenada (Saturday departure with easy connections from 65 Canadian gateways available at www.aircanadavacations.com) from December to April. AC operates year-round daily flights from Toronto to Barbados (Saturday & Sunday departures from Montreal) with connections on LIAT to Grenada. WestJet operates a flight from Toronto to Barbados with connections on LIAT to Grenada. Sunwing offers charter flights at select times of the year. Titan Tours and G.G. Tours offer seasonal flights to Grenada. Alitours (www.alitours.com) and Total Vacations (www.totalvacations.ca) offers year-round land arrangements. Two Islands in One Holiday! Diving Experience package. January 11, 2010. (Grenada, W.I. )—Aquanauts Grenada and Lumbadive Carriacou have teamed up to provide dive travellers with a two island experience in a seven day vacation. “In Carriacou, you are surrounded by greenery and native wildlife for an adventurer’s vacation above and below the surface. 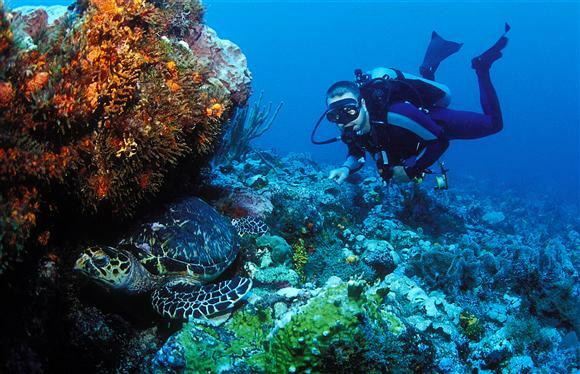 No mass tourism, no industries, no pollution, but sublime diving,” said Richard, owner of Lumbadive Carriacou. A daily ferry service is convenient for divers, as they do not have to interrupt their dive package for travelling between the two islands. Grenada boasts a great variety of wreck diving and a lush interior. “This seven night Grenadine Dive Experience gives divers the best of both islands with a total of four nights in Grenada and three in Carriacou,” said Peter, owner of Aquanauts Grenada. Accommodation partner in Grenada is True Blue Bay Resort, while in Carriacou travellers have the choice between Grand View Inn and Villa Longevue. A typical itinerary starts with three nights and five boat dives in Grenada, on the fourth morning it is time to pack up and enjoy the two hours ferry ride up the west coast of Grenada and past the area of Isle de Rhonde to Carriacou. A transfer will bring the diver to the chosen lodging. The next three days are spent diving “the island of the reefs” – the translation for Carriacou – with Lumbadive. On the last day the afternoon ferry brings guests back to Grenada for one more night at True Blue Bay Resort before the next morning’s departure. Conveniently the resort is only 10 minutes from the airport. A seven night package including 10 boat dives and all transfers starts at US $1350 for the summer period 2011. Customized packages are also available. Grenada can be reached via Air Canada Vacations that operates a seasonal non-stop flight from Toronto to Grenada (Saturday departure with easy connections from 65 Canadian gateways available at www.aircanadavacations.com) from December 18 until April 2011. AC operates year round daily flights from Toronto to Barbados (Saturday & Sunday departure from Montreal) with connections on LIAT to Grenada. Caribbean Airlines operate regularly scheduled flights from Toronto to Barbados and Trinidad with connections on LIAT to Grenada. West Jet operates a flight from Toronto to Barbados with connections on LIAT to Grenada year round. St. Patrick – The Historical & Hospitality Parish; St. Andrew – The Green Parish; St. David – The Pure Spice Parish; St. Mark – The Natural Foods & Wellness Parish; St John – The Fish & Nightlife Parish; Carriacou & Petit Martinique – The Original Culture Parish. August 30, 2010. (Grenada, W.I. )–The idyllic tri-island nation of Grenada is a romantic wedding and honeymoon destination, a place to live out your dream day against a backdrop of swaying palm trees and turquoise blue waters. A destination wedding on the tropical island of Grenada takes all the stress out of planning a wedding and allows couples to focus on enjoying their special time together. Many hotels, inns and resorts throughout the Island offer special wedding and honeymoon packages which they will customize to fit each couple’s needs. No two weddings are ever alike, as they are all designed to reflect the individuals getting married. Wedding packages will often include: transportation to and from the Registrar’s Office, ceremony decorations, bridal bouquet and buttonhole for the groom, services of a professional photographer, wedding cake and celebratory champagne. Whether you are looking to say ‘I do’ on Grenada’s white sand beaches, in the lush rainforest, on a sailboat in the warm waters of the Caribbean, or at one of the many beautiful Island properties, the options are endless. Grenada can be reached via Air Canada Vacations that operates a seasonal direct flight from Toronto to Grenada (Sunday departure with easy connections from major Canadian gateways available at www.aircanadavacations.com) from December until April. AC operates year round daily flights from Toronto to Barbados (Saturday & Sunday departure from Montreal) with connections on LIAT to Grenada. Caribbean Airlines operate regularly scheduled flights from Toronto to Barbados and Trinidad with connections on LIAT to Grenada. GG Tours operates a seasonal summer charter services from July through to September with a weekly direct flight from Toronto to Grenada www.ggtours.ca, as well as Titan Tours www.titantours.com. West Jet operates a flight from Toronto to Barbados with connections on LIAT to Grenada year round. July 29, 2010. (Grenada, W.I. 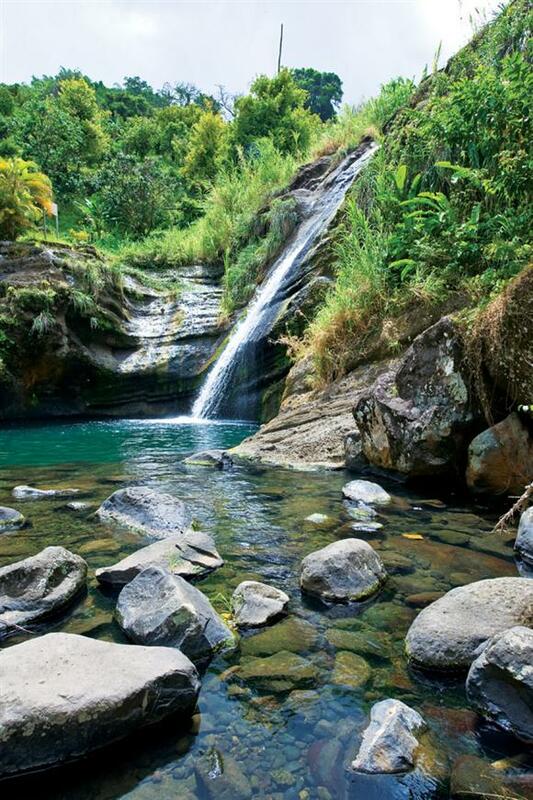 )–For the environmentally conscious traveler, Grenada is the perfect vacation option, with many hiking trails, pristine beaches, rainforests, waterfalls and sustainable activities to take-part in. One of the gems of the Caribbean, Grenada is a part of the Windward Islands, located about 100 miles north of Venezuela. The temperature on the Island ranges from 80 to 85 degrees Fahrenheit year round. With its unique vegetation, topography and diverse wildlife, the country has gone to great lengths to protect this stunning natural environment. The development in Grenada has been unobtrusive; none of the Island’s hotels (that are all family owned with no large hotel chains on the Island) exceed the height of the palm trees, allowing for unobstructed views of the beaches and beautiful surroundings. One ninth of the land mass is dedicated to wildlife sanctuaries and rainforest parks. If you are looking to discover beaches, you’ve come to the right spot. Dotted with small bays and inlets, Grenada and Carriacou are full of stunning white and black sand beaches and with over 40+ dive sites, it is home to some of the best diving in the Caribbean. The world’s first Underwater Sculpture Park can be found here and the sculptures that have been submerged have helped to regenerate marine life. For those looking for further active exploration and adventure there are many other options on land that exist. Grand Etang National Park and Forest Reserve is one of the Island’s most popular locations for bird watching, hiking and trekking. Located in the interior of the Island, up in the mountains, the area is home to several ecological subsystems. Stop by the Grand Etang Lake during your visit to the park, located at 531 meters above sea level, it is a water-filled crater from one of the Island’s extinct volcanoes. During a visit to the Park you’re likely to see a variety of animals and species of birds. If you’re lucky, you’ll even see the mona monkey while hiking in the Grand Etang. This small primate was first introduced to Grenada from West Africa during the time of slavery. Hikes through Grand Etang can range in length from 15 minutes to a number of hours. Visit La Sagesse Nature Centre, on Grenada’s south-west coast, for some of the best bird watching on the island. The government protects the mangrove swamps found along the beaches of La Sagesse, in order to maintain their natural wildlife and vegetation. For a different perspective, go river tubing and spend time floating down the Bathazar River, while taking in the lush vegetation as you glide along. For a truly unique experience, watch the majestic leatherback turtles as they lay their eggs on Levera Beach, a protected area from May to September. Turtle watching can be arranged through Ocean Spirits, a not-for-profit established in 1999 to protect Grenada’s turtles. June 24, 2010. (Grenada, W.I. )–Beautiful beaches, turquoise blue waters and friendly locals, it already sounds perfect, doesn’t it? One thing people don’t always realize is that Grenada is a foodie’s paradise. Fresh produce, seafood caught the very same day and fragrant spices tantalize the taste buds at every meal. The tri-island nation of Grenada is a part of the Windward Islands and is full of distinct, local dishes. Frequently referred to as ‘the Spice of the Caribbean,’ Grenada is the second largest supplier of nutmeg in the world. This spice is a staple in many of the dishes served throughout Grenada and the outer layer of the nutmeg is used to make jams, jellies, syrups, candies, etc. Nutmeg ice cream is a popular treat, for both visitors and locals alike. Nutmeg is such a staple in Grenada that the image appears on the country’s flag. Callaloo is a popular leafy vegetable that is not to be missed when dining on the Island. It is used to make soup, served as a side dish and incorporated into many meals, including the national dish ‘Oil Down’. The ever-popular ‘Oil Down’ is often cooked in large pots on the beach and consists of breadfruit, salted meat, chicken, callaloo, coconut milk, vegetables and dumplings. If you want to get out and eat with the locals, head to the weekly Fish Friday in the town of Gouyave. This event attracts both Grenadians and tourists and is a great opportunity to sample some local dishes including breadfruit chips, fish kebabs, fish lasagna, and lambie waters. Lambie waters is a hot soup made with vegetables and conch and is another must try when in Grenada. For dessert, make sure to try something made with Grenadian chocolate. Unbeknownst to many people, Grenada is also a major producer of cocoa and makes some of the best organic chocolate in the world. The Grenada Chocolate Company, is involved in the chocolate production every step of the way – from growing and processing the cocoa beans to extracting the cocoa butter. This chocolate is an absolute treat and the perfect gift to bring people back home. A visit to ‘the Spice of the Caribbean’ is a unique culinary experience and will leave you with a newfound appreciation for Grenadian cuisine. Grenada can be reached via Air Canada Vacations that operates a seasonal direct flight from Toronto to Grenada (Sunday departure with easy connections from major Canadian gateways available at www.aircanadavacations.com from December until April. AC operates year round daily flights from Toronto to Barbados (Saturday & Sunday departure from Montreal) with connections on LIAT to Grenada. Caribbean Airlines operate regularly scheduled flights from Toronto to Barbados and Trinidad with connections on LIAT to Grenada. GG Tours operates a seasonal summer charter services from July through to September with a weekly direct flight from Toronto to Grenada www.ggtours.ca, as well as Titan Tours www.titantours.com . West Jet operates a flight from Toronto to Barbados with connections on LIAT to Grenada year round. May 28, 2010. (Grenada, W.I. )–A trip to ‘the Spice of the Caribbean’ is an historical and cultural journey. Part of the Windward Islands, the tri-island nation of Grenada, Carriacou and Petite Martinique was first sighted by Christopher Columbus back in 1498 and it is steeped in rich history, unbeknownst to many visitors. The Arawak speaking Amerindians from South America are thought to have been the first settlers in Grenada. These original inhabitants spent their lives working in agriculture and fishing, crafting jewelry and musical instruments, and building boats. These trades and traditions still play an influential role in today’s society. There is a strong French influence in Grenada that goes back to 1649. The name Grenada dates back to this time, when the French named the country ‘la Grenade.’ This name originated in Granada, Spain, in the 1500’s. After the British seized control in 1763, the country became known as Grenada. It was not until February 7, 1974, that Grenada received its independence from Britain, a day that is proudly celebrated each year with beach parties, sporting events and official speeches and presentations. Inhabitants on the tiny island of Carriacou can be traced back as early as 1000 A.D., when Arawaks and then Caribs settled there. Written records from 1656 suggest that the name came from the Carib term, Kayryouacou, meaning ‘land surrounded by reef.’ The island has many unique customs and traditions and was once home to a village of Scottish boat builders. Belmont Estate: This 300 year old plantation is found in Belmont, St. Patrick’s, and is home to a museum, gardens and an old cemetery. Fedon’s Camp: Only accessible by foot, this site is located in the central mountain range of the Grand Etang. It was named after a French planter, who led a revolt against the British in 1795. Fort George: Built back in 1706, Fort George offers a view of the entire skyline of the town of St. George’s. Fort Frederick: This fort was completed in 1791 on Richmond Hill and is another perfect spot for photo opportunities, providing a spectacular view of St. George’s. Grenada National Museum: Housing a variety of historical artifacts, this museum is found in the remains of the old army barracks and prison, built back in 1704. Leapers Hill: This historical landmark received its name after the last Carib Indians sacrificed themselves and leapt off the cliff edge, instead of surrendering to the French in 1651. Plantation House: This beautiful stone building was built back in the 18th century and is a relaxing spot to visit for lunch. River Antoine Rum Distillery: This rum distillery is the oldest functioning water-propelled distillery in the Caribbean. The process they use here to distill rum remains much the same as it did back in the 1800’s. The Carriacou Museum: This museum is housed in a restored cotton gin mill and provides a look at life during the British and French occupation of the islands. Grenada is home to fiercely proud people with a rich heritage and culture. With pristine, white sand beaches, turquoise blue waters, friendly, welcoming people and truly unique historical sites, a trip to Grenada is unlike anything else. Grenada can be reached via Air Canada Vacations that operates a seasonal direct flight from Toronto to Grenada (Sunday departure with easy connections from major Canadian gateways available at www.aircanadavacations.com ) from December until April. AC operates year round daily flights from Toronto to Barbados (Saturday & Sunday departure from Montreal) with connections on LIAT to Grenada. Caribbean Airlines operate regularly scheduled flights from Toronto to Barbados and Trinidad with connections on LIAT to Grenada. GG Tours and Titan Tours operate seasonal charter services (www.ggtours.ca and www.titantours.com ). West Jet operates a flight from Toronto to Barbados with connections on LIAT to Grenada year round. American Airlines operates a non-stop flight three times per week from Miami to Grenada. The multi-lingual website (available in English, French, German, Spanish and Chinese) is the culmination of a year’s work and emphasizes the country’s vibrant culture. The site has a number of new functions including a fully featured trip planner, tour operator locator, interactive map and blog, to name a few. Each aspect helps to create an enhanced experience when visiting Grenada’s website. Trip Planner/Events: This function allows visitors to plan a trip specifically tailored to their travel needs. Through an Expedia link on the site, visitors can book any hotel or resort. Visitors to the website can also create an online profile and save trip plans each step of the way. An interactive events calendar listing all events happening in Grenada (365 days per year!) helps to refine trips. Tour Operator Locator: This unique function allows visitors to locate affiliated tour operators anywhere in the world, providing both location and contact information. Interactive Map: The interactive maps provide views of dive sites, marinas, historical sites, hotels and resorts. Media and Travel Professionals: The section contains news releases and features. Travel professionals can register and create an account, so that they can easily help their clients plan trips to Grenada. Island Blog: Stay up-to-date on what’s going on in Grenada by reading the island blog. Visitor Experiences: A visit to www.grenadagrenadines.com is an interactive experience. Share beautiful island images with other visitors by submitting photos online, or visit the multimedia gallery to watch videos of Grenada. How to Get to Grenada from Canada – Grenada can be reached via Air Canada Vacations that operates a seasonal direct flight from Toronto to Grenada (Sunday departure with easy connections from major Canadian gateways (www.aircanadavacations.com ). AC operates daily flights from Toronto to Barbados (Saturday & Sunday departure from Montreal) with connections on LIAT to Grenada. Caribbean Airlines operate regularly scheduled flights from Toronto to Barbados and Trinidad with connections on LIAT to Grenada. GG Tours and Titan Tours operate seasonal charter services (www.ggtours.ca and www.titantours.com). West Jet operates a flight from Toronto to Barbados with connections on LIAT to Grenada year round.